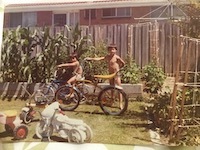 BMX bike I raced in Scottsdale AZ, 1975-1976. Bought at a Scottsdale bike shop, raced at Scottsdale Rodeo Grounds, BAJA in Phoenix, and Jackson's BMX track. Member of 1975/76 Scottsdale, AZ BMX team, "Mother's Custom MotoCrossers"
Great bike and cool old pic......welcome to the site!!! Love the pant leg protector...lol...I remember doing that! Nice to see another pic of one of these. They are sorta rare. I've just posted some pics of mine to the museum. Maybe it'll show up soon. tape, lil john bike, photos ,priceless! first on race day ! Hey Tarrat, I raced that same track at the same time. I also raced at a place called Bouse or something like that, on the west side of Phoenix. I also had a black Littlejohn with Webcos. I don't have any photos, but is cool to find yours. A veteran of desert warfare, badass . Very cool bike. I have the same littlejohn bike, I raced in phx bitd. I have a littlejohn bike. Still to this day.